A hand-made flag linked to the historic Tasmanian observation of the transit of Venus in 1874, has been donated to the Tasmanian Museum and Art Gallery. The 138-year-old flag has returned to Tasmania just days before Venus makes her next transit on 6 June 2012. The donation was made by the great grandson of Charles Walker Raymond, Brigadier General with the US Army, who was part of the famous Transit of Venus expedition that made its home in Campbell Town in 1874-5. 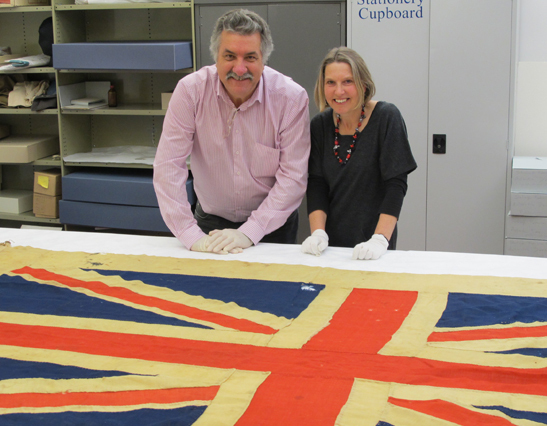 TMAG Senior Curator of History, Elspeth Wishart said the Union Jack was made by locals in Hobart for the American visitors to hang over their observation station, along with their own American flag. “The expedition was initially supposed to go to the Crozet Islands but was unable to. On the suggestion of Campbell Town surgeon and amateur astronomer, Dr William Valentine, the expedition ended up journeying to Campbell Town and witnessed the transit there,” said Ms Wishart. TMAG Director, Bill Bleathman said this historic flag was an important addition to TMAG’s State Collection. “This is great example of how an object can bring history to life. This is about as rare as an item can get and we are really pleased that we have been able to secure it for future generations to enjoy,” said Mr Bleathman. The Transit of Venus is a rare astronomical event that happens in a pattern that repeats every 243 years, with pairs of transits eight years apart separated by long gaps of 121.5 years and 105.5 years. The last time Venus transited across the sun was in 2004 and before that in 1874. The next time (and last in our lifetime) will occur 6 June 2012. A Transit of Venus exhibition, celebrating Campbell Town's historical and contemporary relationship to this unusual event, is on show at the Heritage Highway Musuem. In 1874, Campbell Town was one of just eight sites around the globe selected by the US Naval Observatory to record the Transit of Venus. It features items that have not previously been on public display including the reproduction of two objects used to observe the 1874 transit that are now housed in the National Museum of American History - Smithsonian Institution and the US Naval Observatory. The exhibition also features photographs sourced from a number of collections from Campbell Town, Queensland, New York and London. The Heritage Highway Museum is housed in the former Court House at 103 High Street, Campbell Town. The museum is open to the public Monday to Saturday from 10:00 am to 3:00 pm.